Propulsion: Two 1,500ihp triple expansion steam engines, two shafts. 60k In port, possibly in the New York City area on 2 September 1918, when she was inspected by the Third Naval District. Durham (No. 3345), a cargo ship, was built in 1893 by Workman, Clark and Co., Belfast, Ireland, transferred to the Navy as Sherman by the Shipping Board 30 August 1918; fitted out at Erie Basin, N.Y., and commissioned 30 August 1918 as Sherman, Lieutenant Commander T. J. Turner, USNRF, in command. She was renamed Durham 23 November 1918. Assigned to the Naval Overseas Transportation Service, Durham carried Army Cargo on two voyages from New York to Bordeaux and Marseille, France, between 10 September 1918 and 29 December. 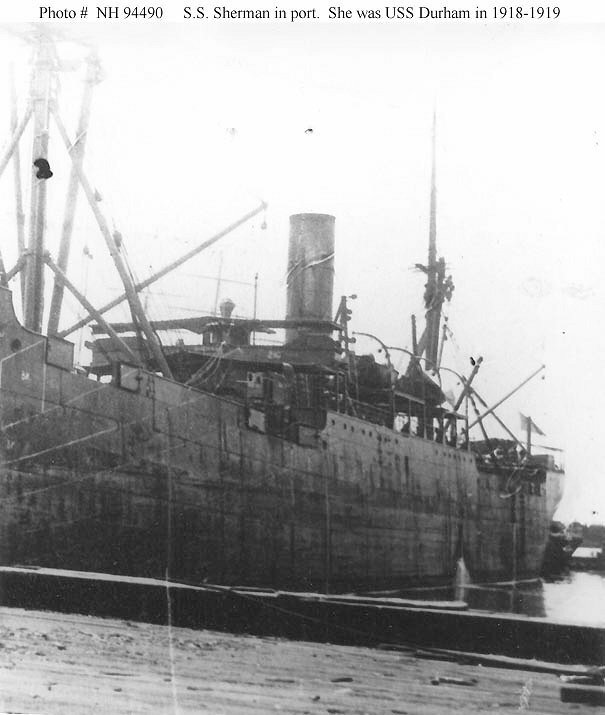 She played an important part in American relief efforts in the Balkans, carrying food to alleviate famine from New York to Adriatic ports on a voyage between 24 January 1919 and 10 April. Durham was decommissioned 29 April 1919 and returned to the Shipping Board the same day.